It has been a long wait for Toyota's success in the Desert Race! 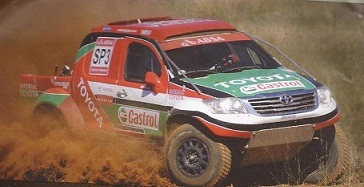 Toyota finally wins the Toyota 1000km Kalahari Desert Race, having last won it in 1999. On Sunday 24th late afternoon the Toyota production vehicles' drivers nestled comfortably into podium positions 1 and 2. The Desert Race took place on the 21st to 24th June 2012 in Kumakwane village, about 25km to the west of the capital Gaborone. The race is undoubtedly the biggest sporting and social event in Botswana. This fun-filled event includes camping out on wintry nights as it takes place during winter season. During the day on Saturday and Sunday, families could be seen preparing and having meals, with other spectators constantly studying the race map, heard chatting vigorously about the race, and cheered on the race drivers as the cars were speeding past. Batswana could not (and will never) get enough of the desert race. In fact the attendance increases every year, and moreso for this year, having gained accreditation from the Dakar Rally the winner will have an automatic entry into the much avowed rally in January 2013, and this saw 20,000 spectators watching the race. The accreditation ensures that amateur car crews be able to compete in the Dakar Challenge. The Desert Race is living up to expectations with its challenging terrain. At times other vehicles cannot cope. With representatives of the Dakar Rally attending the Desert Race, they left fully satisfied that the decision to award the Desert race accreditation into a qualifying race for the Dakar Challenge was correct. In total now, there are four feeder races for qualifiers into the Dakar Rally with the Desert Race included. Others are Australia, China and Egypt. So, back to the race, the spectators were treated to a lengthened sporting event when motorcycles and quads kick-started the proceedings with a 500km run on Thursday 21st June and finished with the same distance the following day. 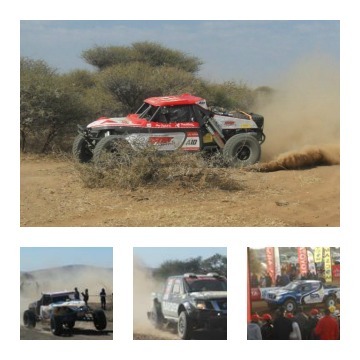 On a chilly Saturday morning with thousands of spectators in position the production cars' race took off from Kumakwane village to do battle on the 500km challenging terrain for the day. On the next day using a different route the drivers travelled the same distance. Duncan Vos and co-driver Rob Howie won the car production category, with Anthony Taylor and partner Chris Birkin coming second as Castrol Team Toyota claimed positions 1 and 2. The third spot went to Christiaan Du Ployy and Henk Janse Van Vuuren in their BMW X3. Last year's winner Chris Visser and co-driver Japie Badenhorst settled for the fourth position. Though the darling of Batswana, South African driver for BMW X3 vehicle Hannes Grobler did not win the race that probably was not the sad news. Instead Batswana will be sad to know that Grobler is retiring from racing. During the race he suffered the same fate as last year when his car broke down from a propeller shaft problem in the second loop of the first 500km on Saturday. All in all, Toyota South Africa and Botswana Government must be applauded for a successful event through their partnership. Other players in the partnership as sponsors of the event are Botswana Tourism Organisation, Mascom phone network, ABSA vehicle and asset finance, 4 Wheel Drive Club of Southern Africa, Toyota Motor Centre and Puma Energy.